It’s time to think beyond color and material and choose a roof customized to your weather region. All roofs are not created equal. 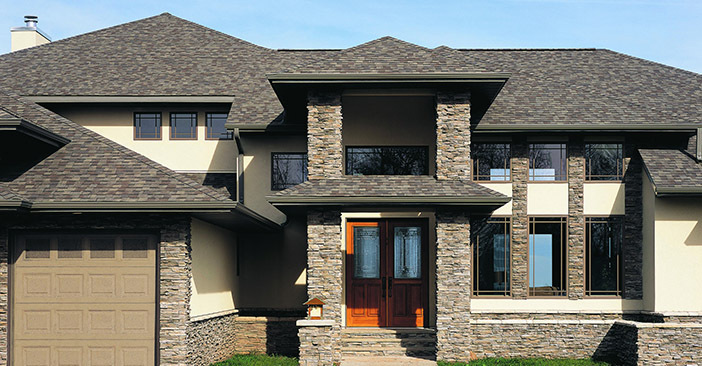 Technology and innovation in building materials, particularly in the last 20 years, means that beyond choosing shingle material, style, and color, you can also dial-in on products that meet your home’s specific needs. One key area of innovation has been dealing with weather extremes. A little up-front research and some questions for your contractor can go a long way in choosing the right roof for your home today, and avoiding repairs tomorrow. Living in an area prone to hail? You’re in luck as most roofing manufacturers offer either separate “impact resistant” products, or versions of their flagship shingle lines offering impact resistance. In order to call these products impact resistant, they are tested against a standard, which includes dropping steel balls to simulate the impact of hail stones. These shingles are generally manufactured using materials that will literally make objects bounce off of them, and are durable enough to protect against the rain, wind and sleet that often accompanying hail. Since hail damage has been on the rise in recent years, many homeowners’ insurance companies are requiring the use of an impact-resistant shingle, or are giving discounts if you have one installed. We recommend checking with your insurance carrier before you make a product selection. Speaking of, when making that selection, look for products that include “impact resistance” in their name and specs, and “Class IV Impact Resistance” – the highest rating available for roofing materials. Blazing temps and prolonged exposure to direct sunlight can wreak havoc on homes, and roofing gets the brunt of the sun’s rays. In addition to causing materials to degrade, this exposure is also heating up the home, putting a strain on cooling systems and sending your utility bill soaring. To combat damage from the sun, manufacturers have shingles that reflect a percentage of the sun’s rays, cutting down significantly on heat absorption. So popular is this idea of “cool roofs” that some states and municipalities in hotter climates have begun incorporating high solar reflectance as requirements into building codes. Interested in a solar reflectant shingle? Look for products that specify they are “solar reflective” which state that they can be used to comply with the 2016 California Title 24 Part 6 Cool Roof Requirements. Many of these products are also ENERGY STAR® rated to reduce energy costs. If you are concerned about algae growth select a shingle like CertainTeed’s XT25 that has a 10-year StreakFighter® warranty. If you’re living in an area of North America that’s humid or damp, roof algae is probably a concern. The good news about algae, which presents as black streaking on your roof, is that while it doesn’t look great, it isn’t actually damaging your roof (read this article from the Asphalt Shingle Manufacturers Association). Watch out though, this eyesore could do a number on your property value. You have options here as well, as most roofing manufacturers have products to combat algae growth. These shingles are usually copper-infused, meaning they have copper granules embedded in the asphalt, and copper prevents algae growth. If you don’t think the look of algae would “grow on you,” seek out shingles that list algae-resistance specifically, many include “AR” in their names to make them easy to identify. All algae warranties aren’t created equal though, so familiarize yourself with the type of coverage provided when researching. A new roof isn’t an everyday occurrence and it’s a large investment. When it’s time, you owe it to yourself and your home to know what your options are. Taking time to do some research will help, and goes a long way toward making a confident decision. Also, working with a trusted contractor is crucial. A skilled and experienced tradesman will help you consider both aesthetics and performance, guiding you in your decision making and giving you peace of mind that you’ve chosen the best roof for your home. What’s most important to your roof? Impact resistance? Cool-roof technology? Algae resistance? Select a term to learn more. Ready to get started? Find a professional you can trust. Plus, what exactly is covered by a lifetime shingle warranty and 8 Questions to Ask Before You Sign that Contract. A professional roofer can always guide you on the best roofing for your area, though I do often talk with several and then compare notes! Then price, license and professionalism play a huge part on which roofing company I’ll go with. I am overwhelmed that i got a good post which says how to choose the right roofing from certainteed. We expecting more post like this. Bravo to the team. There are several things that we have to remember while choosing the roofing for our homes. First of all, budget, weather of your area and the desire. Usually people give priority to their interests that’s why even after spending a lot of money their desire still remains imperfect, because weather is unsuitable. Thus you should always give priority to the weather. If you live in an area where snowfall covers your roof most of the times of year, then you should choose copper or metal roofing. However, snowfall free areas don’t have any issue with any kind of roofing. We almost always install CertainTeed on our customer’s roofs, especially if they leave the choice up to us. I’ve got it on my personal house and it’s an exceptional roof here in North Carolina. We get a good bit of moisture, both through rain and humidity, but it holds up well. A lot of other manufacturers, I see some press issues and discoloration. These issues are actually pretty common for some of the others, but the shingles out of NC from CertainTeed have been solid. Hi Linda, We don’t manufacture OSB sheathing. Our best advice would be to check with the manufacturer of the product to make sure you are get right information. Thanks for the information on roofing materials! My wife and I want to redo our roof, but we haven’t decided what materials we want. I never even thought about the fact that some roofing is more energy efficient than others. I really want to save as much money on energy as possible, so this is something we will definitely look into. I am looking for the vapour permeance of 3/4 inch OSB sheathing.